Here’s another PSICOM published Wattpad inspired book worth reading for those of us who can relate to light, romantic, although somewhat cheesy rom-com stories – Campus Royalties by Purpleyhan. I read about 2/3 of the book one busy Sunday visiting graves of my fathers (in-law and biological) on a post Halloween weekend. I only got to finish the remaining 1/3 of the book recently. The first 2/3 was slow paced so the remaining 1/3 was somewhat forcibly led fast towards the finale. The entire book has only covered about 2 collegiate semesters from June to February and not even an entire year. There was a happy ending of course but I appreciate other books which have extended chapters all the way till the characters are married or even with their own kids. 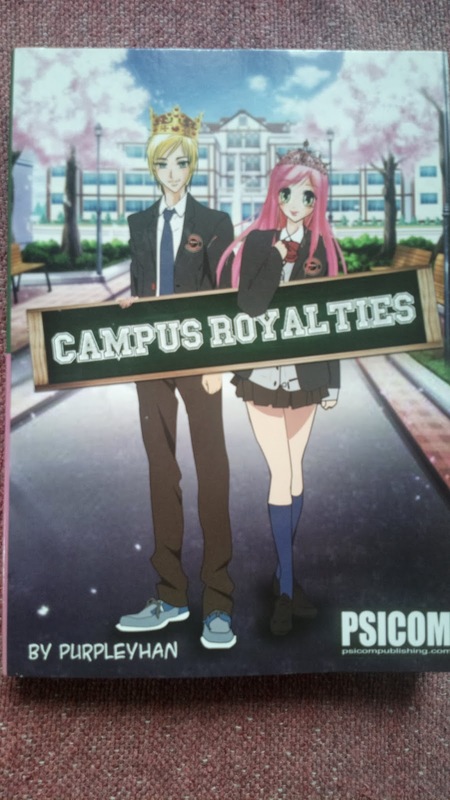 By the way, the book is called thus because the story takes place in Kingdom University where Campus Royalties (Princes and Princesses) are selected based on wit and beauty. Apparently, if I dig deeper enough, there are lessons y’all youngsters can learn from the book albeit love, court, and relationship in nature. 2. Assumption is the mother of all screw ups. Excuse the lingo but true enough, when the heroine, Tiffany “Steff” Damian was assuming that Ian Darryl Garcia didn’t like her and only used her to forget his ex, she screwed up. So it’s best to stop being presumptuous and make clarifications for anything you don’t understand. 3. Don’t be a stalker! Both characters were and it only delayed the inevitable (happy ending at least). Stalking cuts off your tongue too (though not literally). It’s better to communicate than stalk! 4. Listen. When you stalk, make sure to listen to every single word so you don’t miss anything. The same applies to statements. Don’t cut off what the significant other is saying. Let him or her explain it all. Apart from the lessons above, I the love the finale; the February Fest bash was indeed a blast. It was phenomenal, sensational, and was the perfect way for our prince and princess to finally come out clean with their love for each other. The epilogue wherewith the guy sort of summarizes everything was a smart choice although he missed one chapter, the part where he admitted that she was indeed his toy at first but – (she cut him off while trying to explain). The song choices were also ideal and match the characters, story as a whole, and every chapter where a song is featured. I think I mentioned this at the beginning of the post. I hate villainous characters too but oh well; no story is worth the drama without them. Back in college, I’ve never liked romantic stories and appreciated the gloomy or gothic more. This book makes me reminisce old college days and what I’ve missed. I now appreciate even cheesy rom-coms and would be a fan of young love if I could turn back time.